GOAL stands for “Green Oil and Light.” “Green” for the name of the original owners of the old petroleum, brownfield site, and the metaphor of shifting our energy options away from dirty fossil fuels to clean renewables, like biodiesel; and “Light” for the fact that the site is located in Durham’s old “red light” district, a Hope VI community that is rapidly revitalizing, “finding the light” in community and neighborhood based redevelopment. And this provides a great stage for the work being done, in transformation, regeneration and renewal. Revenue to invest in small business and the creation of jobs often flees communities like ours through outsourcing of food and fuel production and capital. 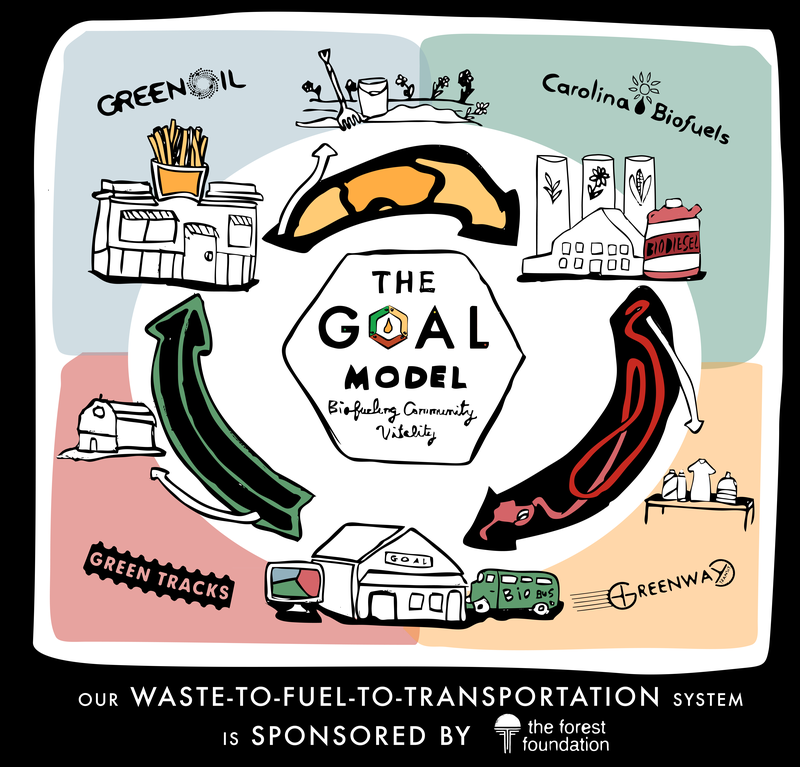 Thus, the aim of the GOAL model is to plug those leakages, by collecting waste veggie oil from local restaurants, converting it into fuel and value adding it into a green transportation business, creating jobs, teaching courses on about sustainability to community members, and supporting a new model in sustainable community development. Today at GOAL, the land is being redeveloped, the soil is being remediated through composting; the biodiesel bus company is moving people, reducing air pollution and carbon footprint, members of the community are learning about the green economy and green jobs are being created. Finally, we use the buses (as well as the physical campus) as a learning lab, raising awareness and motivating people to action! The Triangle Community Carbon Fund is a project of The Forest Foundation, a 501(c)(3) non-profit organization, that promotes sustainable livelihoods through environmental education and green business development. The goal of The Fund is to help capitalize and speed the transition to a renewable, just, and sustainable green economy. By simply donating voluntarily to offset, or mitigate, one’s emissions, or footprint, your contributions to the Triangle Community Carbon Fund will support, or subsidize, local projects that provide the most effective and efficient social, economic and ecological “bang-for-your-buck!” By doing so on a local level, we can internalize major market failures, so market signals and our decision-making can more accurately and properly align supply with demand and build community resiliency. Calculate your emissions using either the EPA’s personal carbon footprint calculator or UC Berkeley’s Cool Climate Small Business Carbon Footprint Calculator. Donate to the Triangle Community Carbon Fund to offset the amount of carbon or pollution you can’t reduce in other ways. (Recommended donation is what you can afford. Current market price is: $14/metric ton, *click here for a full discussion on carbon pricing). The Triangle Community Carbon Fund, with your input, invests/donates your money into projects with the greatest carbon and pollution reduction potential, keeping the money local, providing many secondary benefits and creating local, green jobs. The Forest Foundation’s team carefully selects and curates projects for support. Projects must provide carbon sequestration and/or high value mitigation, as well as a matrix of ancillary benefits, such as: promotion of diverse and distributed renewable energy, green job creation, waste diversion, environmental justice, green economic development and/or other air pollution reductions. The Forest Foundation prefers to work with local non-profits and community organizations, small green businesses, and low-income families to promote social justice and maximize job creation and other benefits. The projects below are the first to be selected for support. The Triangle Community Carbon Fund is accepting applications from local non-profits to subsidize their transportation costs with Greenway Transit Services, a biodiesel busing company, and Carolina Biodiesel, a biodiesel distribution company, both of which share space at the GOAL Site in east Durham and are partially owned by The Forest Foundation, Inc.
Non-profits whose applications are accepted will receive funds to pay for biodiesel fuel in Greenway Transit vehicles, subsidizing the transportation costs and importantly, helping to reduce the exposure of children to toxic air emissions, while growing the demand for community made, cleaner burning biofuels. Benefits: Lower carbon transportation, reduction in air toxins, waste diversion, sustainable community development, green job creation and environmental education. Urban Ministries of Durham is a local Durham non-profit that connects with the community to end homelessness and fight poverty by offering food, shelter and a future to neighbors in need. The Carbon Fund would like to use donations to pay for UMD to have its food waste collected and composted by local third party providers, reducing landfill waste, tipping costs for UMD, and methane emissions, while creating soil. Benefits: Waste diversion, methane reduction, soil production, community development and environmental education.